Hi good morning. Did you know: A hair butter is a good idea if you have dry or thinning hair. 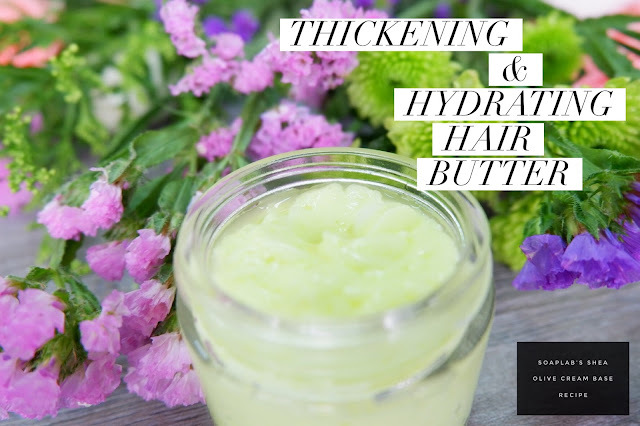 Today’s recipe is for a thickening and hydrating hair butter. In this recipe we are using shea olive cream base as it moisturizes and hydrates the hair. This cream base already has shea butter and olive oil and both as emolients that would moisturise your scalp. Next, we added shea butter and castor oil. Shea butter hydrates the scalp and hair. It reduces excessive oiliness of the scalp which leads to hair growth. For a distinct fruity aroma, add brazilian jackfruit fragrance oil. Finally, add yellow liquid pigment and you will have a hair butter to use. Enjoy! Add in 2g of Polyquat that has been diluted with 4g of glycerin to the container. Also, add in melted Shea Butter into the mixture. Using a pipette, add in 1.5g of Brazilian Jackfruit Fragrance Oil into the mixing container. Go ahead & add in the Castor Oil. Add in 1g of Yellow Liquid Colour Pigment into the mixture. Using a normal baking spatula, mix cream, colour & oil all together until everything is equally dispersed throughout. Get your disposable piping bag and transfer all of the hair conditioner into it. This will make an easy transfer from mixing container to storage jar. Spray storage jar with Rubbing Alcohol in order to provide a sterile environment for your hair butter. Fill hair butter until it reaches the brim of the jar. Do not overfill as it will spill and overflow when you screw your cap on.